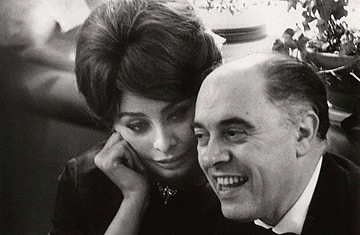 Carlo Ponti with wife Sophia Loren during the Cannes Film Festival in 1961. Boris and Natasha. The gangster and his moll. The statuesque babe and the little round man. Beauty and Obese. That double image, like joke figures on a wedding cake, was the one struck by the great Italian actress Sophia Loren and her discoverer, mentor, curator and prime exhibiter, producer Carlo Ponti. They had been together since 1950  when he was nearly 40, she just 15  and they stayed that way through 56 years, two marriages to each other (the first annulled) and 37 movies that he sponsored and she appeared in. They faced plenty of obstacles: the rude public merriment at their pairing; all the misery the Vatican-cowed Italian government tried to bring to their joint political, financial and personal life; the stories of his infidelities and of the movie stars (Cary Grant, Peter Sellers) utterly smitten by her allure. Yet Ponti and Loren persevered, becoming a metaphor for the lasting attraction of opposites. With his eternally gorgeous wife at his Geneva bedside, Ponti died Tuesday at 94 of that loveliest of incurable maladies, extreme old age. Their off-screen story was every bit as dramatic as any of their movies. It might take the name of one of them: Marriage, Italian-Style. Ponti, then married, had tried keeping his relationship with Loren hush-hush, as his lawyers won a Mexican divorce from his estranged wife, Giuliana. In 1957 the producer and his star were married by proxy in Mexico, with two male attorneys standing in for them. But the Italian government forced the annulment of their marriage and branded Ponti a bigamist. The couple had to live either abroad or secretly in Italy, until 1966 when they became French citizens, the certificate personally signed by Prime Minister Georges Pompidou, and were able to be married there. Two years later, after several miscarriages, Loren gave birth to Carlo Ponti, Jr., the first of their two sons. This happy ending continued, apparently, for nearly four more decades, on family estates in France and Switzerland. But Ponti was not merely the 40- or 49-year husband of Sophia Loren  though, really, gentlemen, wouldn't that be enough? He was one of Italy's grandest producers, perhaps second only to Dino De Laurentiis. The two forged a partnership in the early 50s, when De Laurentiis was producing films with his own bombshell wife, Silvana Mangano. Dino and Carlo's signature film was Un Americano a Roma, a modest comedy about a young Italian besotted with all things American. It expressed the hope of two paisan producers to make films that appealed both to the local market and the American, often by pairing one of their star spouses with a Hollywood name. Thus Mangano played Penelope (and Circe) to Kirk Douglas' Ulysses; Loren was the honey to Anthony Quinn's Attila. Quinn, in Federico Fellini's La Strada, was the circus brute to the sad clown played by Fellini's wife, Giuletta Masina. Europa 51, directed by Roberto Rossellini, starred his then-wife Ingrid Bergman. Their grandest production  King Vidor's War and Peace, with Henry Fonda, Audrey Hepburn and her actor-producer husband Mel Ferrer  was also their biggest flop.